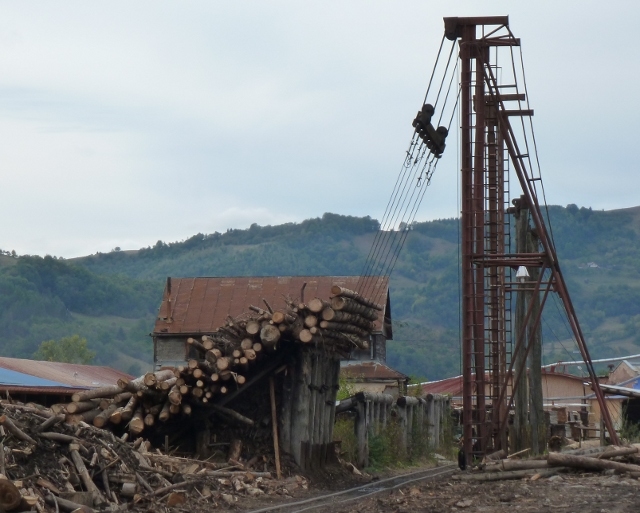 Having spent a day and a half sat in the carpark of the Vișeu sawmill, we’d got familiar with the rhythms of life there. In the early morning, the carpark spent an hour or two filling with tourists ready to get on board the Mocăniță. Once that was out of the way, it all quietened down until they returned in the early afternoon, at which point there was five minutes of frantic activity whilst everybody tried to leave as soon as humanly possible. Shortly afterwards, the real entertainment started as the logging trains started to return. 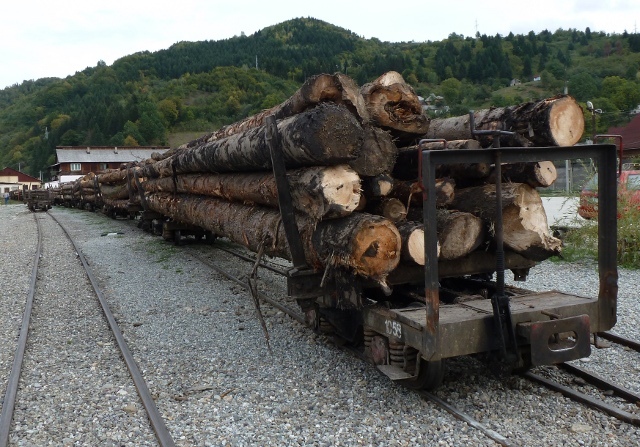 I call them “logging trains”, but they were lacking one usually essential component of a train. A locomotive. Instead, four or five carriages of logs suddenly and almost silently slid to a halt right beside you, one man stood on the front of the second carriage operating the brakes. Each carriage was just a set of wheels – let’s get technical, they’re “bogies” – strapped to each end of a bundle of tree trunks. There’s no need for a loco, since the whole point of the railway is to get wood down from the hills. Which means, of course, there’s something far better than a locomotive – gravity. 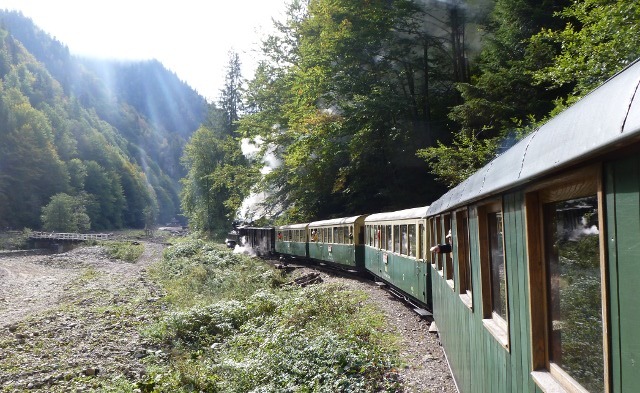 There’s a second reason – since the railway follows the curve of the river up the valley, many of the bends were just far too tight for a standard gauge railway, hence the narrow gauge. And a narrow gauge railway means that big heavy powerful locos are a bit of a non-starter, you can only really use little ones. So they wouldn’t have the oomph to be moving large piles of trees up much of a gradient, either. However, once all the log trains were safely down the hill, the shunter engines started to work hard for their money, pulling and pushing each of the log trains towards the unloading areas. 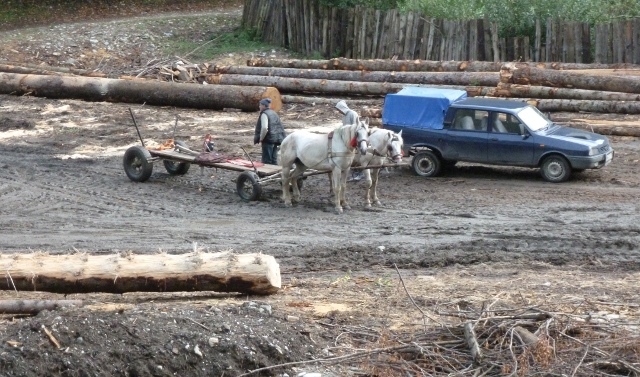 Since there was nothing but the trees joining the front and rear of each carriage, it was easy to just reach underneath the logs with a set of heavy wires and lift, pulling the whole lot at once over a ramped side. Other trees were unloaded by the fistful by large JCB-like vehicles. Once they were all unloaded, the shunter disappeared back off up the hill, with a whole set of little bogies closely coupled together, ready for the next day’s work. This went on deep into darkness, with the quiet pierced by headlights, floodlights and the roar of heavy diesel machinery. But, of course, we were here for a much gentler soundtrack – that of a small steam locomotive. 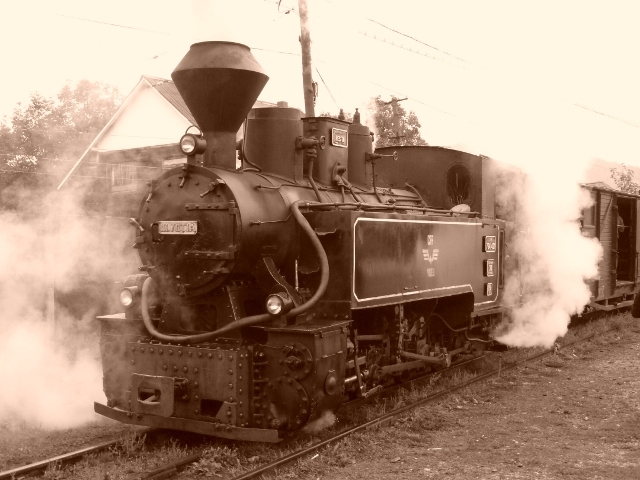 The “Elveția” was a cute little thing, far younger than it appeared – it was only built in the mid ’50s, but the Romanian railway continued to build new steam locos until the mid-70s, especially for forestry use. It, together with several similar sister locos, were restored for tourist use a few years ago by a Swiss company, still involved in the running of the railway – hence the name. 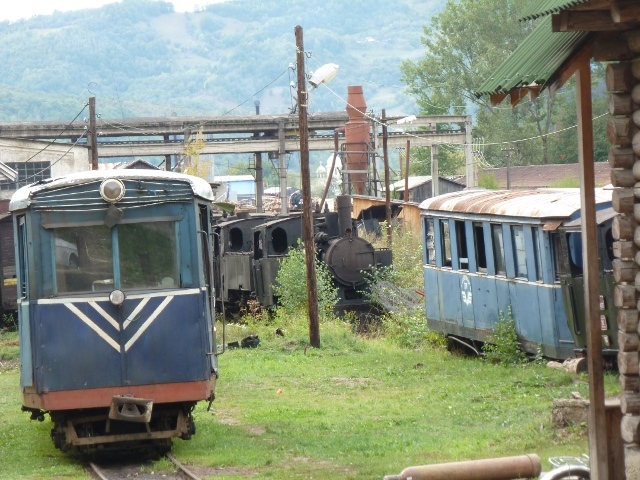 So off we went, past the rail yard, complete with a stock of derelict locos and carriages awaiting restoration, and out through the suburbs of Vișeu and a few villages sitting on the river bank. 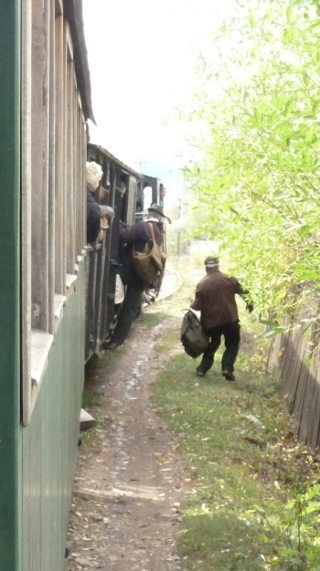 We wound up through the trees, with greenery and rocks barely inches from the carriage – another reason for the narrow gauge… As we followed the river, we passed several little groups of men working away, either trimming treetrunks or loading them onto trucks on the dirt track the other side. Eventually, that track petered out, and we were alone in the woods. A brief pause for the loco to have a drink – a large hose was just dumped into a pool where a side stream fed into the river – and we were off again. The loco wasn’t the only one being refreshed – a small family group in our carriage were being very hospitable, and a large plastic mineral water bottle was doing the rounds of everybody – even being passed over the couplings for the people standing on the outside deck of the next carriage. 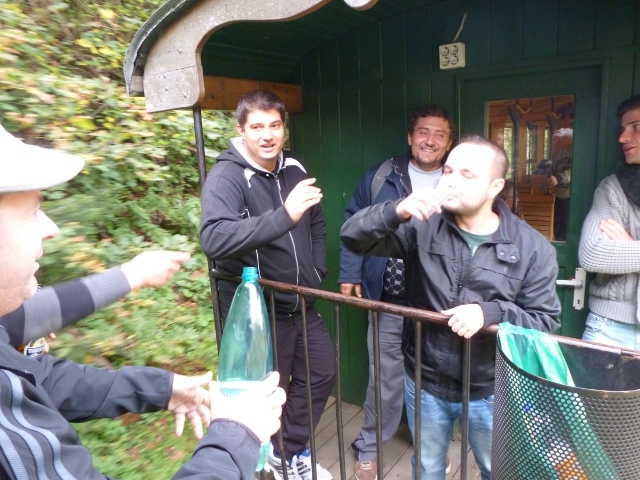 It was, of course, not water but home-made Țuică spirit. 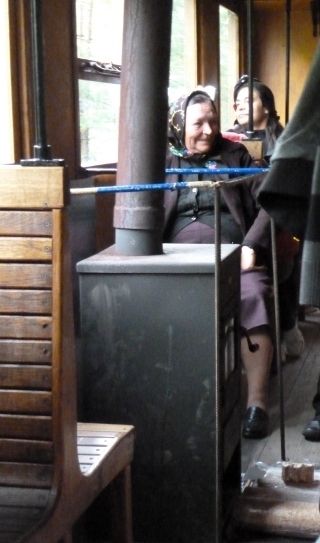 Grandma was sat by the wood-burner, keeping warm – but her home-made bread with a baked-in crumbly cheese filling was being passed around to mop up the Țuică. About 20km up the track from our starting point, we reached our destination – although the working track continues much, much further up, branching off to the side a few times as it goes. Paltin, the location for the end point, is a wide and flat area where the rails widen across three or four tracks. To one side, the river drops over a small weir made of logs. The other side, there’s a small terrace with a wooden cabin for workers to sleep in. For us tourists, there’s a row of long-drop toilets, and a bar/outdoor kitchen area under a large roof. Within seconds of the train stopping, there was a hive of activity around the goods van just behind the loco. Staff were busy chain-ganging plastic crates as fast as they could. Barbecues were lit, and were soon smoking and sizzling away – many of the crates contained sausages or pork steaks. The rest of the crates contained nicely chilled drinks. And so an hour or so passed, before a shrill whistle told us it was time to get moving. The staff wasted no time in packing the left-overs and empties away, and we were off again. 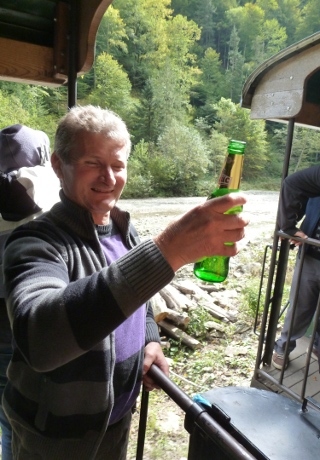 Our friends seemed to have nearly finished the Țuică over lunch, but their hospitality didn’t stop there – they’d got a plastic bag full of cold Ciuc beers, and they weren’t planning on taking any of them home with them. It wasn’t easy, but we managed to persuade them that we had to drive on our return, and that whilst it was very kind of them, we really didn’t need another one. Or two. Or three. Still, they didn’t take it personally – and we’re fairly sure we now know the Romanian for “You’re my beshtesht frien’, you are”. I was even offered a job in the furniture factory one of them owned… Clearly, it’s a fairly successful furniture factory, as when the train returned back to base (dropping various hitch-hiking locals home on the way), they all poured into a brand spankin’ new very large Mercedes 4×4… Even Grandma had taken a shine to us, since she paused from being helped off the carriage to grasp Ellie firmly by both arms and have an affectionate but completely incomprehensible chat with her. And so the yard was quiet again. As we pottered around the van, sorting all our stuff back from “camping” to “driving” positions, ready to head – nothing much moved apart from the yard’s friendly random dog population, scoffing the pink-mystery-meat sandwiches we’d taken up the line with us, but ignored in favour of that barbecue. Everything else just waited for the first of the log trains to sneak in and the activity to commence again for the evening. This entry was posted in By Country - Romania, Food stuff. Bookmark the permalink. Fascinating, and thanks for the photos too which added so much to your tale. I don’t often comment but want to say how much I enjoy the collaboration of colours with DGR. I wish I could read all the other comments too when I write mine.